Hope all those who attended our Christmas Concert enjoyed themselves- it was a fantastic evening and great to see such a good turn out in the audience. For those who couldn’t come, or just want a little reminder of what we played that night, here’s a copy of the program. 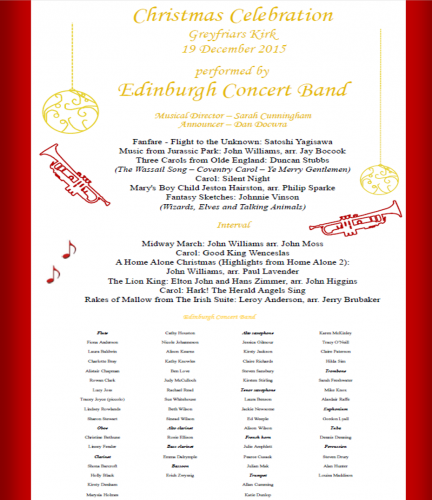 Just the right mixture of Christmassy tunes; well-known hits, such as the Lion King and Jurassic Park; and classic wind band music. Definitely think it got everyone in the holiday mood. The rest of the pictures will be added to the Gallery soon!